The drawing shows the Staubbach waterfall cascading down between two pine-covered cliffs. A large area of the paper is left uncovered. 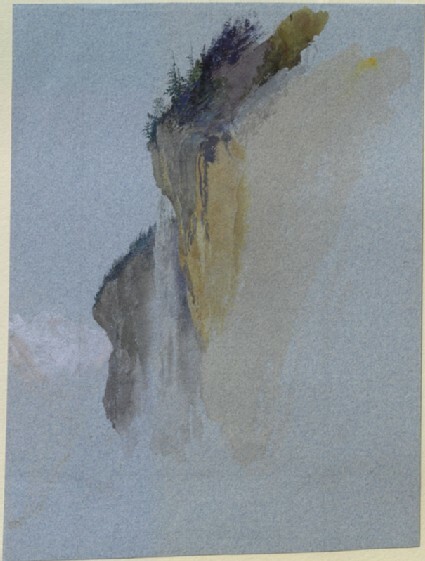 Ruskin visited the Lauterbrunnen valley on a number of occasions, particularly in 1866, when he produced two views of about the same dimensions, and possibly from the same sketchbook, dated to that year. The drawing first appears in the 1878 revisions of the Teaching Collection, as no. 122 in the Rudimentary Series, where it was framed above a study of clouds, alongside other drawings of mountains and skies. By 1906, however, it had been moved to no. 289 in the Educational Series, where it replaced Turner's engraving of an abbey in Yorkshire which had, by then, been removed from the collection. Discussing the drawing in his manuscript catalogue of the Rudimentary Series, Ruskin described it as 'an example of easy pine drawing', and explained that much of the paper had been left grey to prevent the snowy mountians beyond from dominating the watefall and cliff. Ruskin was fascinated with the problem of Alpine denudation, and the reason why some streams 'fall over precipices in which they have cut no ravine whatever (as the Staubbach)', while others 'fall over precipices which they have cut a certain distance back' and others 'have completed for themselves a sloping course throughout the entire mass of the beds they traverse' (Notes on Alpine Denudation, § 8 = XXVI.28). bottom left, in ink: Hibiscus Africanus p. 28.Notebook.15. Sketch of the Staub-bach, slight, but yet useful, as an example of easy pine-drawing, and interesting in noting as state of the fall when the water is low, which, though often despised by travellers, is of exquisite beauty in reality; the water coming dark against the sky at its first drooping from the cliff and diffusing itself, as it were, into a fountain upside down. Note also in this sketch that the paper is left gray, though the water has to come dark against it, because the light in the drawing, if it had ever been completed, would have been on the snowy mountains beyond the lower cliff, which conquered sky and water and all. The quantity of work which is done in the part of this R. sketch which is done ought always to be enough, if well and deliberately applied, to express with sufficient refinement all the form and colour necessary in a sketch. The lower subject in this frame is a memorandum of an exquisitely beautiful sky of English make. The forms of the clouds are those which I had continually in sight at sunrise and sunset in my early youth, being characteristic of South England and North France; their delicacy being partly dependent always on windy and unsettled climate. This sketch was made from the Crystal Palace Hotel, the brown stain on the right being of course London smoke. The crimson of the clouds is raw and unsatisfactory, but if the student will draw skies till he does them as well as this, he will know how to do them better, and perhaps be more fortunate than I in having time to use his knowledge.